Rank and file electricians, calling themselves ‘The Sparks’ have challenged both their employers and theÂ UNITE unionÂ by launching their own wildcat actions whilst remaining in the union. London actions to date include two blockades ofÂ Blackfriars station construction site, a picket outside Stratford’s newÂ Westfield Shopping CentreÂ and most recently an attempt toÂ blockade 110 Cannon Street, a site run by Gratte Brothers. On arrival the Sparks found that management had already closed the site, and headed for Cannon Street Tube where they held a short rally before marching to the #OccupyLSX camp outside St. Pauls. Outside of London actions have taken place at Sellafield, Grangemouth and Ratcliffe power stations, and Lindsey oil refinery. 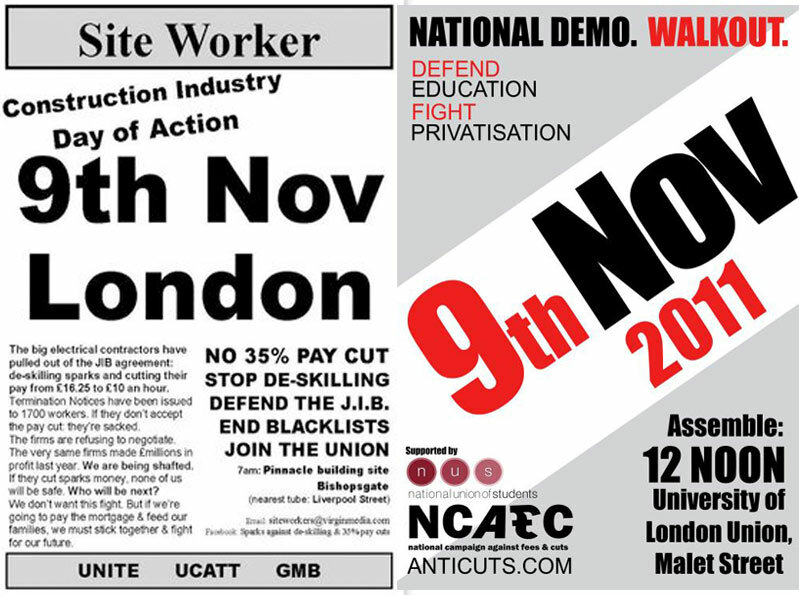 Also taking place on the day, will be the national demonstration against fees, cuts and privatisation which will bring together university, further education and school students from across the country to stage the biggest education protest in the capital since last December. Also planned is a mass walkout of schools, FE colleges and universities by students in support of the demo. The â€œMarch on the Cityâ€ will see thousands descending on the streets of London, starting at the University of London Union, Malet Street through Trafalgar Square and up the Strand, before passing #OccupyLSX camp outside St. Pauls and ending at London Metropolitan University Moorgate campus next to the City of London, the heart of the financial capital. The day of protest is aimed at the governmentâ€™s education reform bill which is a crude attempt to corporatise the education sector.